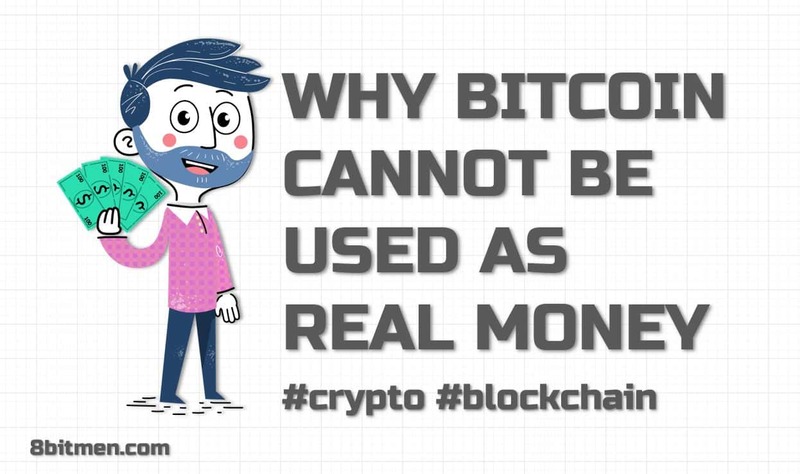 In this super interesting write-up, we are going to discuss Why Bitcoin or any other similar cryptocurrency cannot be used as a real, general use currency in our day to day lives? Why can’t it be real money? Is it just because the people sitting up the ladder, making big finance related decisions don’t want that or are there any technical limitations with crypto coins? It’s been 10 years since bitcoin made its grand entry in the payment space. And in my view, it’s good enough time for a tech or an idea to make its mark. Bitcoin soared upto approx. 20K $ but only for once. And then kind of had a steep fall. And it’s been lying low ever since. Lemme list down the reasons which I think are kind of primary why bitcoin is not the real money in today’s world? Imagine a scenario, where I own a cafe & sell a coffee mug for 4$. I start accepting Bitcoin as a mode of payment & convert 4$ into X Bitcoins wrt to Bitcoin Dollar conversion rate at that point in time. Just for the sake of understanding, let’s say 1 coffee mug is 1 bitcoin. I sell 100 coffee mugs in a day, earn 100X Bitcoins which should be worth 400$s. But since Bitcoin is highly volatile & is in the state of continual fluctuation it goes down by 20%. I convert 100X Bitcoins to Dollars & to my shock I get only 320$s in return. I have a loss of 80$ in a day. What if I cashed Bitcoins after a month? There is no regulation over the price fluctuation. It has the capacity to move at a crazy rate wiping off all the money off the investor’s account. Had I been using the regular dollar currency. The transactions would be pretty consistent. This is why regulating bodies in Stock markets put a circuit limit on the stock price movement for a day. There is a limit to which a price can fluctuate to minimize investor’s loss. If you are aware of the blockchain tech, you would know that it’ has a decentralized design. That means multiple nodes are instrumental in the network when a transaction goes through. Which adds latency to the transactions. The transactions are comparatively slower than the regular Paypal or Visa payments. Also, there is a high chance of transaction failure & a price fluctuation while the transaction is going through. The additional transaction network costs go as high as 7 to 8$, which again is too high in comparison to the regular money wire. This is one of the reasons Stripe stopped accepting payments via Bitcoin. A Bitcoin transaction involves some serious CPU intensive computations which require pretty powerful hardware. If you’ve ever mined Bitcoin, you would know that to compete with other miners we need to set up pretty solid hardware to process the transactions at a quick pace & make good bucks. The transactions in a blockchain network are prioritized according to the hardware capabilities. This kind of hardware consumes quite an amount of energy to run. Now since Bitcoin is a global currency imagine every single one of us making transactions via Bitcoins. I can’t even fathom the energy requirements a global bitcoin ecosystem would have. What about the countries with not so good infrastructure? How are they gonna handle the payments? Also, this kind of setup would require more machines, more data centres. More data centres, more heat. More heat, environmental disaster. Hacking attacks – Ctrl + Shift + Deleting the crypto from the wallet. Everything is online. No hard cash. Just like in movies, one press of a button & Whoosh… all our money gone. Fraud Crypto Products – Since, the advent of crypto, a lot of companies have come up with fancy whitepapers & making you rich instantly promises to lure the investors into pouring money into their product just to disappear with everything to a far-off remote island. The thought of having a universal currency with no middle-man & the control going out of the hands of the government seems exciting but things are not that straight forward. Sometimes, we do need some kind of regulation, someone to watch over to curb illicit activities. Also, countries allowing crypto have set up regulations & regulatory bodies to oversee money going in & out to prevent frauds, money laundering, crime etc. There Is a limit to the number of Bitcoins that can be whipped up, as per the core design. What if we need more currency? What do we do? Change the protocol, generate more Bitcoins? Move to a different currency? For now, Bitcoin is more of an asset, something to be used alongside the real government stamped currency, as opposed to being an autonomous currency. But all these reasons does not mean other products built on the blockchain, the underlying tech, cannot be used in our everyday lives. But this is a discussion for another write-up. 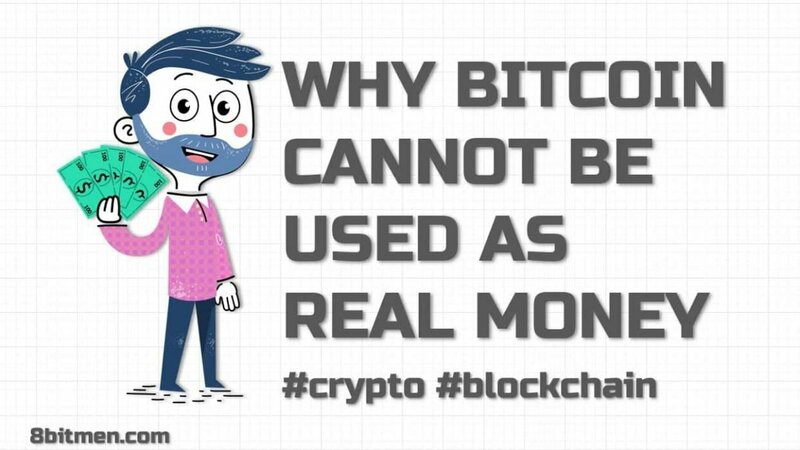 This is pretty much it on why Bitcoin cannot be used as real money. I would love to know your views on this. If you liked the article, do share it with your folks. It helps a lot in getting visibility with the readers. Follow 8bitmen on social media to stay notified on the new developments in software engineering, blockchain, distributed systems, system design, real-life architecture space.